The two days of Pakistan Fashion Week (PFW) UK at Kensington Hall, which opened to mixed fanfare with low media coverage, was an attempt to cater to local interest a la British Pakistanis and expats. The event held from September 23 till 25, was a joint effort by model Kiran Malik — who opened and closed the shows — and National Union of Pakistani Students and Alumni (NUPSA), that volunteered 90 members for logistical support. PFW played it safe this year, as few designers released fresh looks on the ramp, while the rest showcased pieces that are all too common across the border. This is not to say that PFW’s catwalks flopped entirely. From western wear to bridal pret and evening/formals, the clothes vouched for the high level of skill and craftsmanship of our designers. And yet, a good majority of the collections lacked impact and ingenuity, with too many having dry commercial appeal and looking like the sort of prototypical outfits/joras easily available at multi-brand outlets or boutiques in Pakistan. Rana Noman’s Burooj Couture line serves as an example — the work is impressive yet static and it may be considered ‘novel’ by audiences abroad but, closer to home, experienced fashion enthusiasts know better. However, names and labels the likes of Ayeshah F Hashwani, Fahad Hussayn, Waseem Noor, Naushemian, Akif Mehmood, Amna Farhan and Lajwanti stood out by churning a diverse array of interpretations that blended modern sensibilities with traditional textures and motifs. 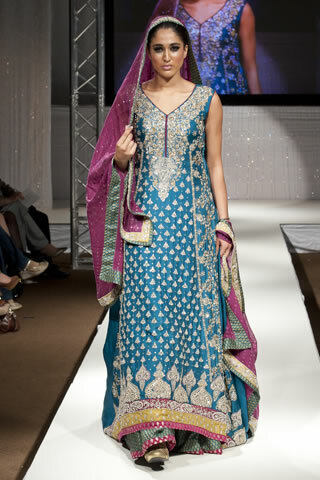 UK-based Pakistani designer Omar Mansoor (who attended both days) says, “The best among all were Hussayn, Noor’s heavy formals, and Mehmood’s line from day one.” Hussayn’s telltale, experimental flair dominates his line — a turquoise jumpsuit (women) and wide-legged pants (men) being the most eye-catching ensemble out of the collection. On a similar note, Mehmood takes a rather avant-garde approach. His line features bold, vibrant hues on billowing dresses and adding a youthful touch — coupled with traditional, handicraft motifs in a junction between East and West. More reserved but otherwise elegant, Noor’s clever interplay of gold and white tones makes him a strong contender this year, especially close to the in the forthcoming wedding season. “In my opinion, Nauman Afreen of Naushemian rocked the ramp with his jaw-dropping styling for menswear,” adds Mansoor. Mansoor’s words seem true as Afreen’s standout collection is a testament to how far tasteful experimentation can take Pakistani menswear. The designer kept the palette dark and theatrical, vaguely reminiscent of Japanese designer Miharayasuhiro and Omar Farooq’s Republic. Afreen’s aesthetic works with dark sherwanis and blazers coupled with harem pants and grey, silk scarves — the overall look being svelte and edgy, is ideal for the modern man who invests in fashion and isn’t is not afraid to put himself out there. When juxtaposed with Hashwani’s revamping of hot looks from the twenties (hers is an interpretation of the cult era’s cuts and textures — flappers galore), Afreen and designers like him dominated PFW in the UK. Hashwani, Hussayn and Afreen’s designs (to name a few) comment on the value of creative tinkering and experimentation to in a burgeoning Pakistani fashion scene. Additionally, their work evinces an eye for international market trends, making Pakistan accessible to a larger, global fashion audience. Source The Express Tribune, October 3rd, 2011.